Cheese, Sausage, Pancakes and Intrigue? I've told you before about my alter ego....remember? Not only am I a mystery-solving caterer, in my spare time, I also run a cookie shop and bake up lots of goodies for my friends, family and neighbors. I do believe I'm getting a complex, though. I mean, each time I come up with a fabulous recipe that begs to be shared, somebody winds up dead. With a piece of my fabulous creation close at hand. Mind you, the cause of death has never been the actual food, but still...it's enough to give a girl a complex. This time was no exception... Marge shared her comforting, homey, delicious recipe for apple turnovers with me so that my partner Lisa and I could bake up a bunch to donate to the local charity event this past weekend. Several of us were kept beyond busy making and baking these for 3 days. Everybody seemed to love them. But, as luck or lack of? would have it, I found my 13th-ish dead body (sorry, that sounds so blunt...but true) the other day. And of course a half eaten apple turnover was sitting close by. I feel like I should tell you that I'm not going to be sharing the recipe for the apple turnovers. Nope. Not today. Today I want to share some killer ba dum bum pancakes with you. My sister Michelle made them for me the other morning as I was fumbling for my morning cup of fuel at 4 am. These are not your everyday run of the mill flap jacks. No sir, they are that perfect mix of sweet and savory that I adore so much. Well, only sweet if you top them with syrup. Which I highly recommend! Beat the egg with a wire whisk in medium bowl until fluffy. Whisk in yogurt, cream and vegetable oil. In a small bowl, combine baking powder, baking soda, and salt with the flour. Stir it around with a fork until it's evenly distributed. Add dry ingredients to wet and stir well. Add sausage and cheese to your batter and stir thoroughly. Bake as you would normal pancakes on your favorite pancake making surface. These were sooooooo good. SO GOOD! It's like a pancake on a stick or bacon baked into your waffle. Mmmmmm. Breakfast. And honestly, I snacked on a few throughout the day at room temp (w/out syrup). Good that way, too. I doubled the recipe and ended up with a lot! Okay, you probably guessed that I DO NOT own a cookie shop...and I don't find dead bodies on a regular basis...and I don't have a sister named Michelle. BUT, Hannah Swensen does. Hannah is the main character in the fun foodie-mystery series by Joanne Fluke. 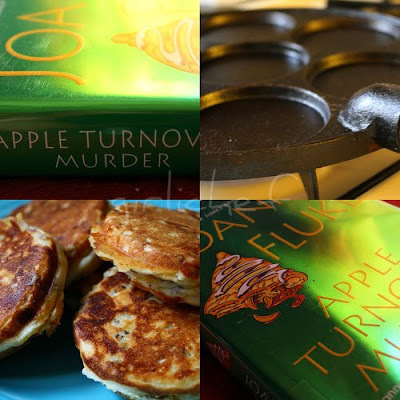 Her latest book is called Apple Turnover Murder. It's the 13th deliciously sinful guilty pleasure in the series and just as fun as the rest. I'm a mystery lover. I'm a food lover. Her books have mystery. And food (recipes included!). Need I say more? Challenging...nope. Do I care...nope. This is just one of the foodie-type mystery series' that I love (and pine for in between release dates). If you haven't read any, you should definitely check them out. For a double recipe I used about 2/3 of a 1 lb. roll of Bob Evans breakfast sausage. I just sprinkled the rest over the top of the syrup for a delicious garnish. I can't wait to try this recipe - it looks so good!! I've been meaning to try those books. I got a gift certificate for books for Christmas and have written the titles down. Great post...I really enjoyed it. 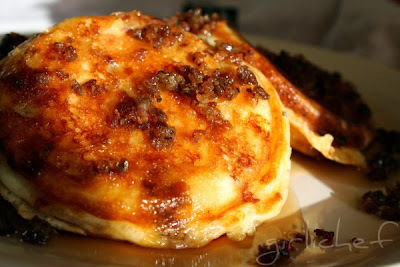 Those pancakes look amazing and I am going to surprise my husband who thinks he is the Pancake King...Thank you for sharing this recipe. For some, you are a wife, mother, daughter and more.....For me you are like a pancake cooking deity sent from above.... No no...don't ruin my daydream. I have to run to the kitchen to get cooking!! Heather, everytime I get sucked in - I knew there were no deaths, but a cookie shop - that I could believe, heck with your bacon cookies I would be one of your biggest fans! 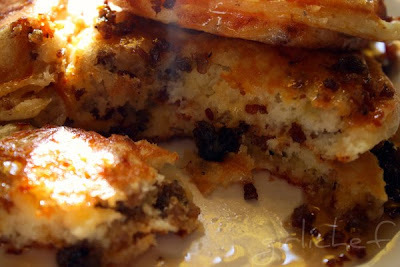 But sausage in the pancakes - oh what brilliance - I am making them soon! Thanks for being a great hoster and poster of the Hearth and Soul Hop! Don't you just love Hannah? And Moishe, too? When will she choose Norman??? Ok, I digress, from one foodie-mystery lover to another, Heather, you rock! You just made this non-sweets-loving girl very happy. In fact, I just decided that I'm gonna make this for dinner, which is less than two hours from now, total plan B switcheroo. Thanks for bringing back the good stuff for the Hearth and Soul hop. Girl, that is so funny. I just finished that book (she's a favorite of mine too) and meant to copy the pancake recipe, but of course, never got around to it. Glad you test tried it for me. Looks so yummy! The sausage and syrup are a great combination. Pasta done right...and done right again. Garlic Chili Shrimp for National Garlic Day! !